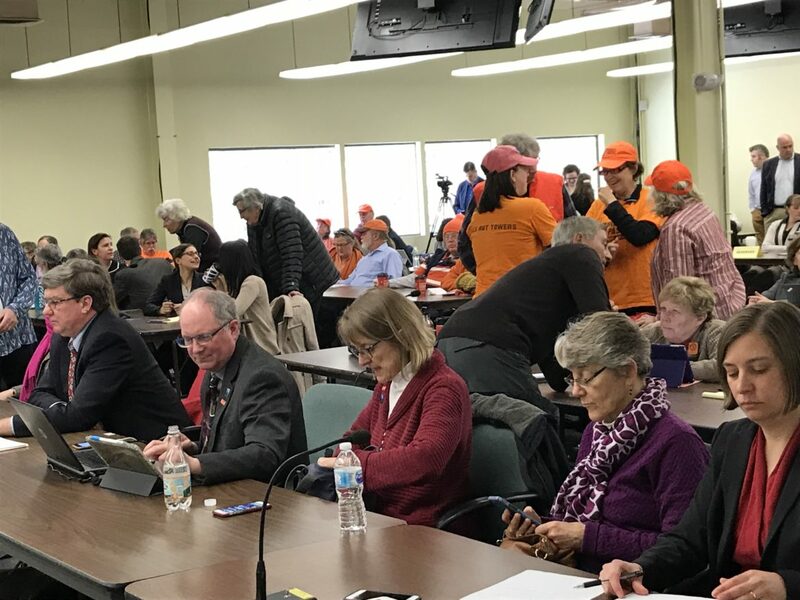 The Northern Pass meeting room at 49 Donovan St., in Concord was filled Monday as the Site Evaluation Committee met to deliberate Northern Pass' motion to vacate its denial and resume deliberations. Please subscribe to InDepthNH.org’s free Friday weekly news roundup and Sunday weekender here. CONCORD — Any decision on reconsidering Northern Pass’s application to build a 192-mile transmission line will wait until May after the Site Evaluation Committee decided Monday to suspend its oral denial of the project. 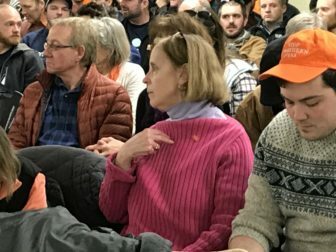 Judy Reardon, a senior adviser with Protect the Granite State, is pictured in the foreground in the crowd of people who attended Monday’s Site Evaluation Committee meeting in Concord. The committee voted to wait until a written decision is issued essentially punting project developer Eversource’s request to reconsider its earlier decision and reopen deliberations on the four criteria needed to issue a construction certificate. The committee’s action means any decision on the project will come after the Massachusetts Clean Energy Project’s March 27 deadline for negotiations with the state’s electric distributors. Massachusetts energy officials chose Northern Pass to supply 2,000 megawatts of Hydro-Quebec electricity to the state by 2020. Project spokesman Martin Murray said he could not say how the SEC’s decision would affect negotiations for the clean energy contract. Massachusetts officials decided last month to also negotiate with Central Maine Power as well as Northern Pass. 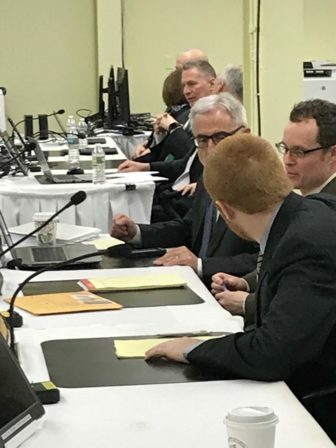 Northern Pass NH President William Quinlan, pictured far background, Tom Pappas and Counsel for the Public Chris Aslin are pictured at Monday’s Site Evaluation Committee meeting in Concord. Committee attorney Michael Iacopino said the deadlines for reconsideration motions and to file objections means the SEC is not likely to meet until May to decide on all the motions. While the committee suspended its oral decision, the project cannot move forward without a certificate from the SEC. “This essentially means they’re kicking the can down the road,” said Jack Savage of the Society for the Protection of New Hampshire Forests, which opposes the project. Project officials saw the decision a little differently. “We hope it is an indication that the SEC will evaluate the required statutory criteria, as well as thoroughly consider all of the conditions that could provide the basis for granting approval,” Murray said. The committee voted 5-0 on Monday because Christopher Way of the Department of Resources and Economic Development and William Oldenburg of the Department of Transportation, were not at the meeting. Kathryn M. Bailey of the Public Utilities Commission, Craig Wright of the Department of Environmental Services, and the two public members, Patricia Weathersby and Rachel Dandeneau, joined chairman Martin Honigberg in Monday’s vote. Last month, the SEC voted 7-0 to deny the application because project developer Eversource failed to meet its burden of proof the project would not unduly interfere with the orderly development of the region, one of four criteria. Suspending the oral decision and the question of reopening deliberations that Eversource seeks does not change the committee’s vote to deny the application, said member Patricia Weathersby. She said while it might be a good idea to reopen deliberations to consider the two standards the committee did not address, it would only be instructive. SEC vice chair Kathryn M. Bailey said she was persuaded by the Counsel for the Public’s filing that it would be good practice to deliberate all four criteria, but committee chair Martin Honigberg said the committee has no obligation to do that. “It is not our roll to advise someone on something that is a hypothetical,” he said. When Honigberg asked if any member wanted to make a motion to reopen deliberations, no one did. The committee may consider the request again once rehearing motions are filed after the written order is issued. The SEC has a deadline of March 31 to issue the written order. After Eversource asked the SEC to vacate its order, reconsider its decision and reopen deliberations, a number of intervenors filed responses indicating the motions were premature until a written ordered is issued. A request for reconsideration should indicate where the committee committed an error of fact, reasoning or law, but without a written decision that is impossible, wrote Counsel for the Public Christopher Aslin. If the SEC does decide not to reconsider its decision, Northern Pass could appeal the case to the NH Supreme Court, which could take about a year to decide. First proposed in 2010, the 192-mile, $1.6 billion, 1,090 megawatt transmission line stretching from Pittsburg to Deerfield, the project has drawn protests from 29 of the 31 host communities and many residents. Supporters say Northern Pass will help diversify the region’s electric generation, help lower the cost of electricity, provide jobs and tax revenues for host communities. But opponents say it would be a scar across the face of the state, only serve as an extension cord for Canadian power to southern New England, while lowering property values, hurting tourism and disrupting the region’s economy. Eversource had hoped to begin construction next month. Project officials say they can still meet the 2020 goal for operation if the project is approved soon. But Savage said the decision does nothing to move Northern Pass forward. “The committee decided not to reopen deliberations, and it’s actually good more than one member expressed confidence in their original decision” Savage said.